A native of Mexico, Juan is an artist formally trained in oil, acrylic, watercolor, pastel, pencil and ink. Juan is also knowledgeable and skilled in Mexican traditional arts such as paper cutting, paper molding, piñatas and murals. 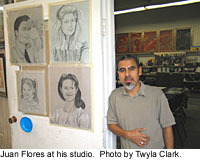 His program could focus on the step-by-step process required for murals or sculptures. Or, Juan could lead students in various Mexican traditional arts. He is also experienced in teaching basic drawing. His presentations require Spanish/English translation.